Devotion to the elements of Our Lord's Passion aside, it is in Eucharistic devotions that there is a most clear division between east and west. Although both teach exactly the same content, both use very different words to very different ends. Thomas Aquinas and his students made this most clear in their ideas of what exactly is Transubstantiation. The east does not have such clear definitions about what happens not about when it happens. In certain ways the bread is holy from the moment it is formed into a loaf and stamped with the holy seal. It is treated so even before the service starts: prayers of, if you will, pre-consecration happen well-before the scheduled "start" of liturgy. In a real sense, the Liturgy is always on-going and our human actions just "connect" with the continual divine action. Thus some Roman Catholic devotions seem, at their heart, to objectify and idolize the consecrated elements in a needless way. Speaking of Our Lord as a "Prisoner (of Love) in the Tabernacle" - a common-place in a certain mode of Roman Catholic piety - seems very odd. Even though in the Western Rites of the Orthodox Church there is the feast of Corpus Christi and Benediction of the Blessed Sacrament, these things do not exist in most Byzantine Rites. One must look - as below - to devotions before and after communion to find what the East teaches on this matter. I have used the Canon of Preparation for Holy Communion to provide the texts below. Why marvel ye at me? Today, in the Byzantine Rite, is the Sunday before the Nativity and the Gospel assigned is that of the Genealogy of Jesus from Matthew. It's rough going for the Deacon reading because it's one hard name after another. I'm sure it's equally fun in languages other than English. In his sermon after, our Archdeacon touched on a lot of points but one struck me as the answer to "Why marvel ye at me?" From Solomon's adulterous parentage to slavery in Babylon, from Gentile blood to Egyptian poverty, the ancestry of Jesus has something to scandalize nearly every portion of the Roman world, and he was conceived out of wedlock! Mary, in Orthodoxy, is sinless, but not without scandal. The family tree of Jesus is of royal lineage, but he's not a direct heir to the throne. He is of the House of David but only via cadency, He's less royalty and more like all the folks who can claim Queen Victoria as a member of their family tree. Mary is indeed a Marvel: fulfilling the prophecy without coming close to fulfilling the expectations. She is - just as her son is - exactly what was promised and not at all what anyone was looking for. She, devoid of human value and without connections or power - and still the subject of gossip in the Talmud - is exactly perfect as the mother of the God who needs his diapers changed. Her son will die a state-sponsored death as a condemned revolutionary, betrayed into the hands of a colonial power by his own people. But that - as with Mary - is God showing us that nothing is out of his hands. The worse things we as humans can do to ourselves or others can, in his hands, become the salvation of the whole world. Bread containing the dead skin flakes and sweat of you and me - both of us sinners - becomes the flesh of the God who needed his diapers changed by his sinless mother who was a scandal in her town. God takes what we have. Our cultural failures, our sins, our loss, our personal fouls and parking tickets, offered to God, become what saves us. Emmanuel means "God with us." In the Eastern Rite, at Great Compline on 24 December (and again before Theophany) the clergy and choir sing "God is with us" over and over. "God is with us! Understand this, O ye nations and submit yourselves for God is with us!" At the same time a cantor is reading verses from the prophet Isaiah. It can sound as if we're singing "God's on our side so here's a finger for you heathen." But that's not what's being said here. Emmanuel means "God is with us and not against us". Not "God's with us and not you". St Paul reminds us, "Quoniam non est nobis colluctatio adversus carnem et sanguinem, sed adversus principes, et potestates, adversus mundi rectores tenebrarum harum, contra spiritualia nequitiae, in caelestibus." For our wrestling is not against flesh and blood; but against principalities and power, against the rulers of the world of this darkness, against the spirits of wickedness in the high places. - Ephesians 6:12. We have no human enemies. Our mission, to humans, is to save them: we can count no one as outside of our evangelistic reach. God's with all humans in his image. It is entirely impossible for God not to be with that human being over there: although it is possible for them to spend their entire life pushing God away and to pretend God's not there with us all. In the end, God's presence may be rejected forever, but he's not going away. Our enemies, though: the ones God's not with, are the demons: the ones who don't want us to be with God who cry out always, "careful, don't get sucked in there, you have to be yourself! Stand up to him! Tell him to back off, this is your space: you need your space!" Emmanuel. God is with us! The verse says God is the long-expected, but he comes in a way unexpected. Islam and Judaism both say that God has no body. Christianity, to the contrary, says God has both flesh and blood, has known death. God had diapers. God had the normal human functions of eating, drinking, of urination and defecation. God, being a male human, went through puberty and probably knows the heart-break of acne, a voice cracking at important moments during his bar mitzvah, and the teenage angst of involuntary erections. The scriptures say he who watches over Israel neither slumbers nor sleeps - but God is with us and he sleeps, dreams, tosses and turns, snores maybe, passing out on the ground from exhaustion, God wakes to find a stone has made a bruise on his back. These simple physical realities and embarrassments are part of being human and an absolute scandal to those who say God has no body. As Fr Olivier Clement tells us, "True mysticism is to discover the extraordinary in the ordinary": in every human action, God is with us. God nursed at his mother's breast, teethed on her fingers, woke her up for a 2am feeding. Joseph, it's your turn... Yes, honeyzzzzz. God is with us: in this life, in this world. Everything is made a sacrament. Recently in Spain a party stole over 200 consecrated hosts (the modern practice of "communion in the hand" comes into its own) and used them in an act of desecration called "art". It is possible to use any sacrament in the wrong way: it is not, as St Paul says, appropriate to discuss what they do. But any sacrament, from communion to marital love can be desecrated. Any action of God in this world can be abused from birth to death. To be honest, I do sometimes get angry enough that I want to forget God has claimed the vengeance for himself, but he has and I cannot undo that. Desecration of the Holy Eucharist no less than desecration of marriage or human life is left for God to be the vengeful party. But God is with us means God is with the humans doing the desecration no less than those of us who weep at the same actions. It is a human doing the desecration, yes, but the actions are those of the demons. They have no bodies and need us to do their deeds. God is with us: we can do his deeds as well, in the body, as he was. Our job is not to avenge God: but to be God's actions of reconciliation and love even to those who are sinners. God is with all of us sinners against the demons. At Christmas, we celebrate wholeheartedly, the incarnation of God. But we tend to sentimentalize it. We make it about this tender moment "round yon virgin, Mother and Child." We get wrapped up in a swaddling cloth of childhood memories and songs about a 'sleigh bells in the snow". But Christmas is about the most horrifying event in the world: the maker of all who is too large to be contained in the physical world, becomes a zygote, and then a baby in the womb of a human woman. Understand this: and submit yourself. We have very little theological base on which to read about Christ as our King: having earthly Kings (who were largely Christian) and not living in democracies we never worried about "Christian Laws". When the state became non- or anti-Christian we shouldered on under persecution. We simply had no power in those cultures to attempt (or effect) change. In the west this was not so. But even there the Church was late to the discussion - only about 100 years ahead of the east, in fact. I've been reading up a lot on the Roman Catholic idea of the Social Kingship of Christ. I will try to keep this Advent meditation away from the "I took a class once/I read that book once" level of discourse. I do not know enough about this doctrine and, of course, being Orthodox, I disagree with any idea that the Roman church is the sine qua non of earthly manifestations of the Kingdom of God. But that said, I think the idea is one that needs to be studied by the Orthodox. In the Western Rite we observe the feast of Christ the King, which feast on the last Sunday of October is not of ancient origin, but rather "Pope Pius XI instituted the Feast of Christ the King in his 1925 encyclical letter Quas primas, in response to growing nationalism and secularism" (quoth the wiki). The first observance of this festal innovation was on 31 October 1926. I see not but that 89 years later we are still suffering from growing secularism. Nationalism won the day a while ago: we no longer think of our religion as our primary identity, or even our secondary one. In many conversations one may encounter a cultural assumption that the laws of a state define what is good and true rather than only what is legal. Recently I heard voiced a sense of surprise that the Roman and Orthodox Churches would not change their doctrines of marriage based on the decision of the US Supreme Court. (I'm discussing this regardless of the obvious dismissal of those churches as existing outside the USA.) The party clearly had no idea that the Church declares what is moral in the law of God and the laws of the state are judged moral or not by that same law. The Church, herself, has no power to change what God says, only to respond to it. I think this surprise is because of the great silence I mentioned above. We don't talk about the laws a lot - or about our Christian duties to legislate for God's kingdom. When a Roman Catholic politician says she will not have an abortion - because it's a sin - but she will work to pass laws allowing others to get them, she has violated the teachings of her Church: there are documents, encyclicals, and saints to back that up. This is not so in Orthodoxy even though our moral teaching is the same: we have no place to point and say, "See, Senator Snowe, you have violated the teachings of your Church by supporting these laws." Even now reading this some of my readers will say "but we are a democracy" implying thereby that Christians should not even attempt to legislate their morals into the laws of the land. I, myself, hold a non-Christian gov't as a nullity, with no say over me beyond keeping the peace between persons - and our gov't is increasingly poor at that. Yet, is there an obligation to me as a Citizen of the Kingdom of God resident in this nation? There is a slogan, "No Jesus, No Peace: Know Jesus, Know Peace." If we are living out the Gospel as our primary function (seek ye first the Kingdom of God) we will become good persons and, being good persons, we can be good residents of the place where we live, good neighbors, good friends and coworkers of those around us. This is not the same as "nice" and "well respected". Nor is it the same as "productive" or "partisan". The Kingship of Christ is one of obligation rather than of accommodation: if one lives in the Kingdom of God, one is obligated to transform day-to-day life into that Kingdom. A friend feeds the poor in his city, despite the fact that it is illegal to do so - as the Rabbis say it was also in ancient Sodom. That is a moral thing to do and it makes him a good citizen - even as he violates the law. The Kingship of Christ is a paradox, as we were taught by Jesus: the first are last, the last are first. The meek inherit the earth. Those who hunger and thirst after righteousness will be filled with what they crave. The rich, however, will be sent empty, away. And very empty: spiritually dead and also spiritually corrupting;in this we must agree with those radicals of another religion. How do you live the Kingdom present, despite the laws around you? I'm tired of people (Christians and not) hijacking Christmas for their politcal ends. The "poverty" of the Holy Family was not a thing at all until Francis of Assisi got obsessed with proving Jesus owned nothing. This was a serious theological debate in the 12th and 13th centuries and it has come down to us in the Christmas Story: Francis was the first person, we think, to set up a "living manger scene" and that's flavoured our western read of the Christmas Story ever since, especially among Protestants who divested themselves of Tradition and bought into as much sentimentality as possible. In honour of the Protestant appeal to Sola Scriptura, let us look at the Gospel first: there is no way at all you can read the story of the Holy Family in Luke 1 and 2 and get the idea of poverty or indigency. Mary's family is wealthy enough to send her - on her own - off to stay with her cousin for six months. In a culture where families depended on the labour of children to maintain the household, this is important. They were able to send her to her cousin's house to work for that household instead. When the holy family got to Bethleham, there is no evidence in the text of "evil landlords keeping a poor family out in the cold." Rather the inns are full. There's a difference of import there: at best there are too many Shriners in town for a convention. That happened a couple of years ago in San Francisco: the America's Cup was here and there wasn't a room to be had for love or money anywhere within 50 miles. My parents tried. 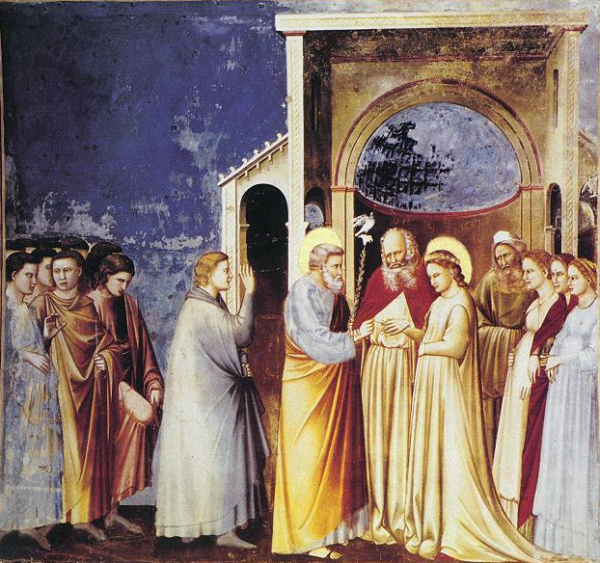 When the time came for Mary to be betrothed, all the traditions are in agreement: Joseph was chosen because he was old enough and wealthy enough to care for the girl. Some accounts have him as old as 80! 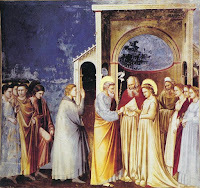 An image search on "Espousal of the Blessed Virgin Mary" will reveal no shortage of images of Joseph with grey hair and beard - as heads up this post. I'm nearly willing to bet that the less grey his hair is, the more modern the image is. For as many men as might want a younger wife, we're very uncomfortable in our modern world with the idea of an arranged marriage to someone so old: but that is entierly in keeping with the Jewish Tradition. Romance, however, and letting your daughter marry someone poor, is not, at all. What we have - from Francis of Assisi to Francis of Rome today and every ECUSA sermon I've ever heard - is a reading into the text of modern political sensibilities. Many folks simply want Jesus to be poor and homeless for our own political ends. One political thing I will take from the story of the Holy Familly: they followed without protest the orders of a foreign, colonizing power. Jesus and his parents never challenged the political authorities of his day - only the religious ones. Try protesting in his name now. I know, of course, that from the outside lookin in, both the traditional stories and the modern innovations are equally "reading in" to the text. I'd rather side with Churh Tradition on this point, however. In the Mystery of the Transfiguration, God is revealed as he really is: a human man, fully divine, enfleshed, and loving us so dearly. In the Transfiguration the Son of God is revealed as God the Son. There are some religions that insist the divine has no body. They are wrong and are denying Christ who is God and Man in spite: those statements coming after God's Incarnation are a rejection of God. The Transfiguration also reveals man as he really is: fully participating in the divine dance, as was intended to be our place before the Fall. Through Christ, the human and divine united, we are made one with God's divine energies but not his essence: Christ alone bears both humanity and divinity in full without loss or commingling. The only thing he doesn't carry is sin. The Transfiguration reveals to his disciples, as the hymns show, that this is God and all that he does he does of his own will. In praying this Mystery, I add "... who was Transfigured on Tabor" after the Holy Name.